Hi Bo! Happy Dog of the Day! So...YOU'RE the now famous Cassie the Vizsla's beloved husband! I knew the second I read that your bethrothed was a Vizsla I just knew you had to be the one! hehe What a gorgeous couple you two make, and now the both of you laying claim to the vaunted title, Dog of the Day!! Cassie is one lucky girl, having a hubby as beautiful, as athletic and energetic, as talented and intelligent, as sweet and loving as you, Bo! And speaking of "lucky..." How well your family's decision to choose adoption has been rewarded, having a furkid, a best furry friend and full fledged family member in you! You truly are the perfect fit for them and their lifestyle, the perfect combo of high energy and chill, hehe! (Not every family/human able to keep up with a spirited, "15 miles per day" Aussie. ) You truly are one in a million, Bo, beautiful inside and out, pawsitively perfect in every way! Thanks for the BIG smiles, sweetheart! Meeting you today, seeing your heart-melting photos, has been a real treat! I hope you're enjoying a very special, fun and adventure filled, action packed day of celebration....spending special time with Cassie and your bestie the Samoyed, running and playing to your heart's content! And what better way to end your day than chowing down on some crunchy carrots and the meat of your choice, lol, sharing tons of chill cuddle time with your humans! Lots of love, hugs and kisses to you, beautiful Bo, our very special and most deserving Dog of the Day, EVERY day! Love to dear Cassie and your Samy pal, too! What a wonderful Friday the 13th addition to the family. Active and cuddly, a perfect fit to your family. Dearest Bo, you are adorable! And how nice to realize that you are Cassie the Vizsla's husband! You have the softest-looking fur and the sweetest face. You have the most delightful personality, too! You are full of energy and make your dear persons smile with your antics. You are also very affectionate and love everyone you meet. You love to go on long runs, play with your family, and then cuddle. You and the Samoyed next door are best friends. You and your dear family members and dear wife Cassie and dear Samoyed pal all love each other very much, don't you. What a wonderful love-filled home you share! 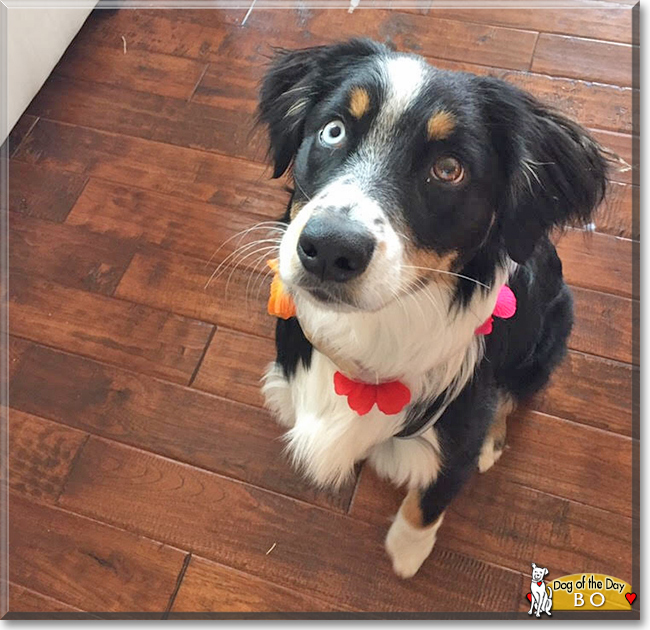 Congratulations, darling Bo, on being chosen today's Dog of the Day! We hope you and dear Cassie and Samoyed buddy and all your family and friends are enjoying a fine celebration, full of fun and lovies and all your favorite games and treats. Last edited by phesina; 02-03-2019 at 06:14 AM. Congratulations on being Dog of the Day, handsome Bo! It's nice to meet Cassie's husband. Oh my goodness what a absolute cutie!! !